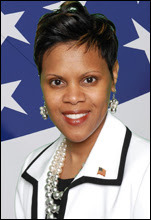 AFRICAN AMERICAN REPORTS: Is NJ Assemblywoman Shavonda Sumter planning a run for governor? Is NJ Assemblywoman Shavonda Sumter planning a run for governor? While the names of mostly white male Democrats (Fulop, Sweeney, Lesniak, Murphy) have been tossed around during speculation about who will run for Governor of New Jersey in 2017, it seems that there may someone else looking to run. According to NJ.Com that someone might be African American Democrat Assemblywoman Shavonda Sumter. Certainty about whether Assemblywoman Shavonda Sumter, D-Passaic, will be running for governor dramatically grew today -- though not exactly as she planned it. At an event in Jersey City this morning where Sumter was scheduled to speak, state Sen. Sandra B. Cunningham, D-Jersey City, mistakenly introduced the assemblywoman as having already thrown her hat in the ring. "If you've been watching the news, and you've heard about who's running for governor, you may not have heard her, but she announced that she is running for governor," Cunningham said. Sumter, who was running late to the event and arrived shortly after Cunningham's introduction, quickly responded to the senator's gaffe with a sense of humor. "Senator Cunningham just shared with me that she shared the good news prior to my announcement," the 35th District assemblywoman said to laughs from dozens of people in the audience. Shortly after her remarks at today's event, Sumter declined to confirm with The Jersey Journal that she is running for governor, only going so far as to say the possibility is under "serious consideration."